Today was practically a holiday for those of us who enjoy Star Trek and the exciting glimpse it provides into what the future could be like. 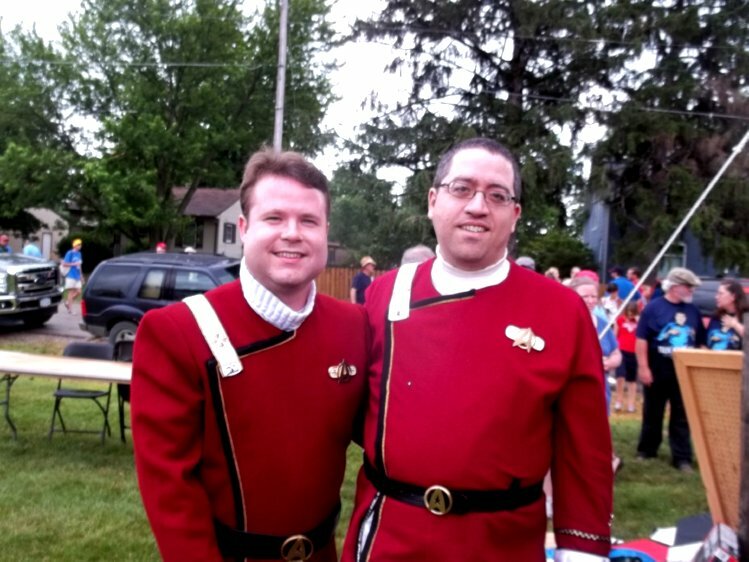 Trek Fest is a yearly celebration of the future birth of Captain James T. Kirk (played by William Shatner). In the movie Star Trek IV, Kirk refers to being “from Iowa”. 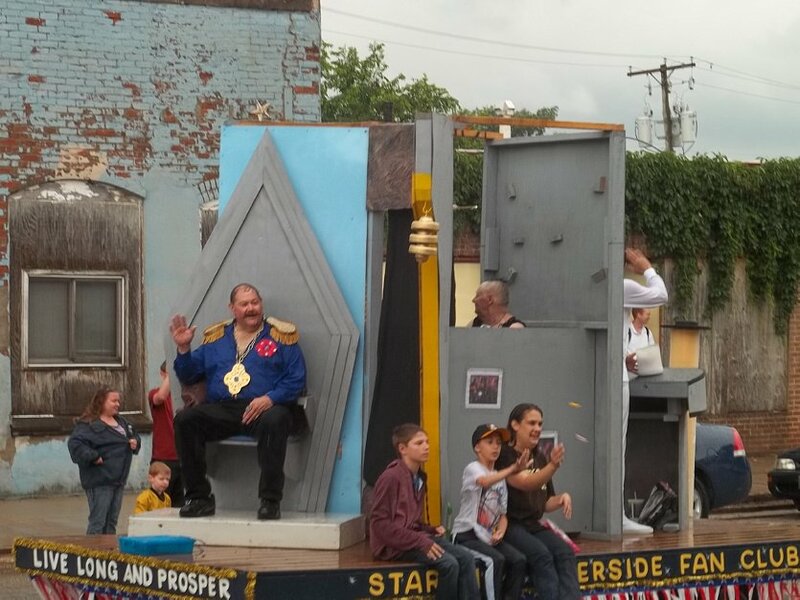 The town of Riverside laid claim to being the birthplace and Star Trek creator, Gene Roddenberry, was supportive. A monument in town marks the future birthplace. Today’s yearly parade was nearly halted by rain… but thankfully the rain stopped as the many vehicles passed down the main street of tiny Riverside, Iowa (just ten minutes from the Hills campground). 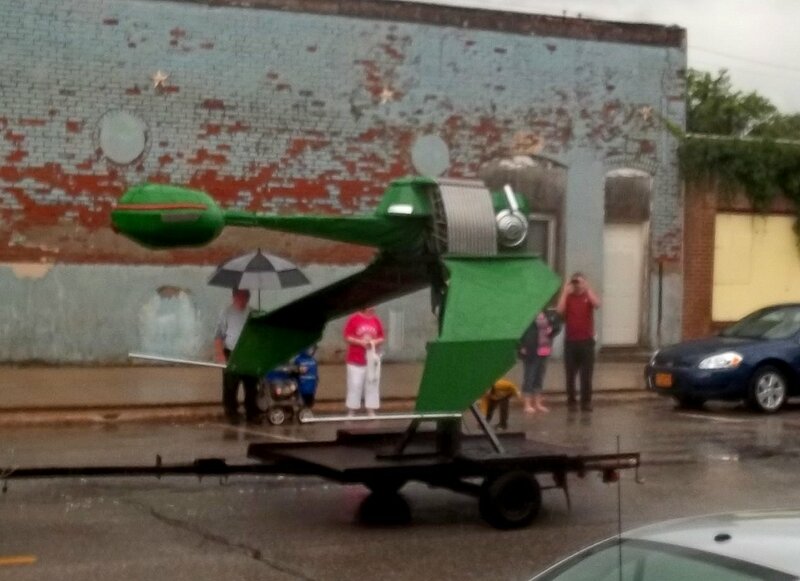 There were Trek-themed floats, fire engines, tractors, the Shriners’ cars, etc. And candy was flying everywhere! The theme of this Trekfest was “I, Mudd”, based on an episode of the original Star Trek series. 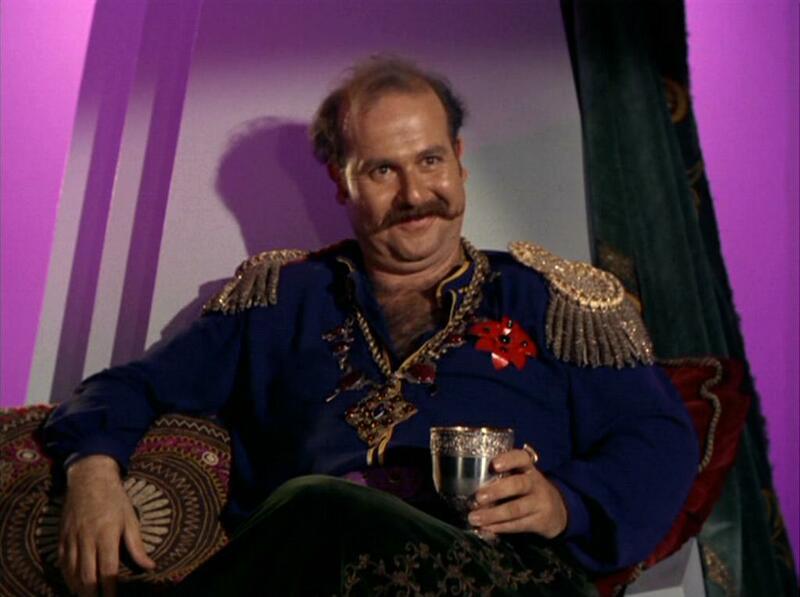 Harcourt Fenton Mudd, a flamboyant character played by Roger C. Carmel, appeared in two original Trek episodes. His character was slimy – a renegade con man who had a thing for the ladies and was more than willing to break just about any law he chose. In the episode “I, Mudd”, Harry Mudd created hundreds of gorgeous android women and one homely, obnoxious one, “Stella” – a tribute to his wife. 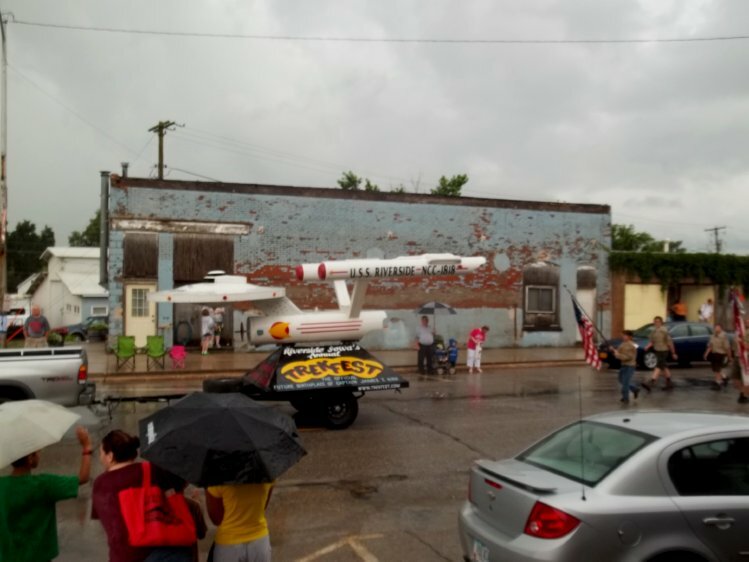 Candy was flying everywhere as the vehicles passed by (note the right side of the picture). Being an overgrown kid, I would run out into the street near the vehicles and retrieve goodies to give to the kids whose parents made them stay by the curb. It was a blast! Of course, I got a number of candies for myself including the less-than-popular Starlight mints – a great addition to a hot cup of Earl Grey tea. It was a good time. Thankfully, there are some other Star Trek geeks in the universe. 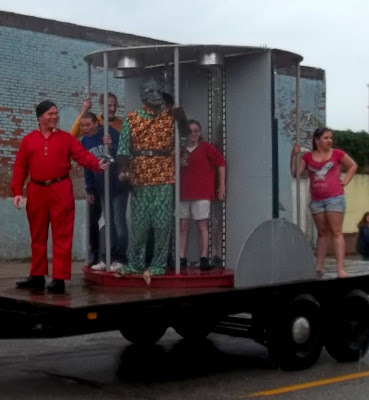 Each year I keep thinking about doing something cool in the parade using my own vehicle. It would be fun to add two PVC tubes to look like engines and put banners on the side to advertise vandwelling and tell about the cool technology inside. But each time, it seems best to fly under the radar a bit longer. Maybe in two or three hundred years the world might be more accepting! 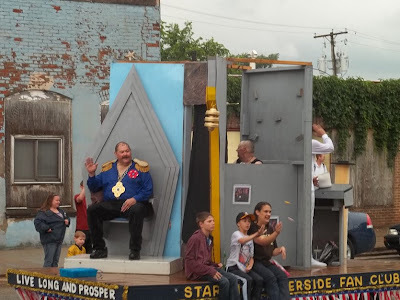 It was fun though… The Trek Fest this year saw a resurgence of attendance and new floats. That made it worth the drive! So what’s new with the vandwelling? There have been a lot of miscellaneous things going on the last couple of weeks since the job situation went to heck. The van’s roof racks were rusting badly and I repaired them. The alternator also went to heck and I replaced it and got some cool pictures of it and the roof rack cancer fix… There is a new kitchen appliance which is dramatically reducing the Diet Coke intake. I’ll probably do another post before the next camping trip and share some of the misc. tweaks. Maybe some day this generator box will get finished, too! Thanks for stopping by. Live long and prosper! Thank you for this – it was a lot of fun to read.